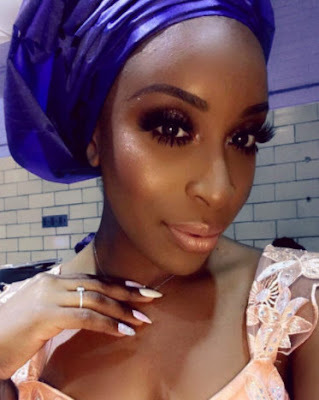 Jackie Aina Slays in Nigerian Aso-Ebi + Get's Engaged? The beauty vlogger is seen repping her birth country of Nigeria in these pics.She wore what is probably an Aso-Ebi to an event recently. She spotted a blue headpiece known as 'gele' in Nigeria. She paired it with a cropped blouse and fitted skirt....both made from lace fabric. As usual, her makeup is fierce. Now *whispering* I have noticed what looks like an engagement ring on her recently. The first time I noticed it was in one of her videos, now she is seen showing it off here again. Well, when word got out a few months back that she was engaged and about to tie the knot, she denied it on twitter.